Customers want real-time clarification and confirmation when they make important choices, purchases, or decisions. They want to speak with someone while browsing your website to answer a quick question before they commit. And at that point they do not want to call your 1-800 number and then have to start all over again. Your business, therefore, needs a way to offer crucial real-time help to customers while they are on your site. 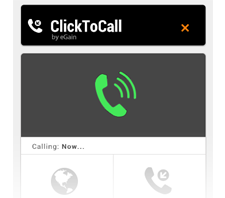 eGain ClickToCall™ is a simple yet powerful solution that can be quickly implemented on web pages to offer real-time voice assistance to online visitors looking for customer service. It lets you call them over traditional voice channels like a land line or a mobile phone or, if the customer wants, you can speak with them over the computer. The call can be set up instantly or scheduled at a later time, based on the customer’s preference. And to handle the click-to-call requests, you can leverage your existing contact center agent pool. Shopping cart abandonment rates are as high as 88% now! Offer interactive voice assistance at the point of purchase, right when the prospect is experiencing indecision, to turn around the deal for you. Help clients make significant decisions that could benefit from expert guidance in real-time, for example, during complex financial planning, while choosing healthcare options, or making insurance and large ticket purchases. In the face of inevitable product commoditization and escalating pricing pressure, smart businesses are building brands on service differentiation. Forge an identity around excellent service. Clients who have received help from businesses with click-to-call support are delighted and spread the word among friends. Blog: Rumors of the demise of scheduled maintenance downtime are not exaggerated, thanks to eGain Cloud AlwaysOn™!